Massimo Camia is both the chef-owner and the name of a restaurant Piedmont insiders know is one of the top three or four places to eat in the Langhe today. No gimmicks, fancy showpiece cellars or faddy ingredients, just precise, outstanding cooking of traditional Piedmontese dishes revisited with intelligence and style. The polite, unobtrusive service, the white wines served immediately at the right temperature, and the very reasonable waiting times between one dish and the ones that follow it (not always the case even in some famous Langhe spots) are other very welcome pluses. Camia started out learning the trade in larger hotels, before opening his first place in Mondovì back in 1986. However, his ascent to stardom began when he opened the Locanda del Borgo Antico in the heart of Barolo in 1990, a marvelous place I remember fondly and was truly sorry to see close as Camia went trying new experiences nearby. Recently, he has launched his new, one Michelin star restaurant located within the confines of the Damilano winery and with a beautiful view of Barolo’s vineyards, with wife Luciana guiding the dining room with her usual grace and charm. Despite the association with Damilano, the restaurant wine list spans almost every well-known Barolo and Barbaresco producer known, as well as offering wines from all over Europe and the rest of the world. I’d like a longer list of older vintages, but for the most part there are many excellent fairly priced bottles to choose from. After not one but two marvelous amuse-bouches (the second was a slice of plump cotechino on a luxurious potato cream: seeing I had liked it so much, Camia himself brought out another portion), I kicked things off in style with Gaja’s iconic 2008 Gaia & Rey Chardonnay, one of the very few Italian Chardonnays that can be considered world class. The 2008 vintage, famous for very classic Barolos, has also delivered a taut, varietally accurate white that is more Chablis than Meursault in its definition, with a laser beam of mineral-inflected green banana and vanilla tones. 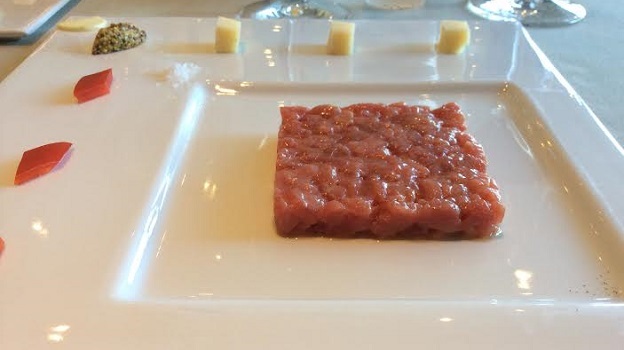 It matched heavenly with the cotechino, by the way, and it didn’t overpower the delicate, heavenly soft carne cruda that followed my amuse-bouches. 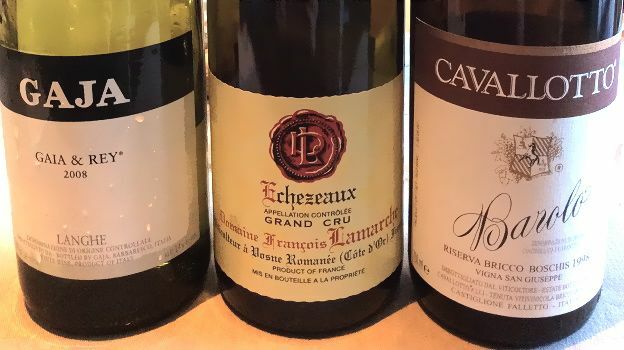 The wines by François Lamarche are never blockbusters, and the 2008 Échézeaux is a case in point: but it is beautifully balanced, with archetypal Burgundian Pinot Noir grace and charm delivered in spades. The tannins are surprisingly supple for a 2008: considering how miserable 2008 could have turned out to be (millerandage, oidium, mildew, and rain were all part of a growing season that was essentially saved by nearly perfect late September weather) this is a remarkably polished, successful wine that matched well with my lusciously creamy plin. Barolo lovers know that Cavallotto is a bastion of traditionally-made wines, and their 1998 Barolo Riserva Bricco Boschis Vigna San Giuseppe is a case in point. Made from roughly fifty year-old vines, this is a big strapping wine that is drinking well enough now but that would benefit from another 7-8 years in the cellar to smoothen further. It will turn out to be longer-lived than I had originally anticipated. Although it’s at present a little angular and austere – like so many Barolos in this vintage of generally flesh-challenged wines – I’m always a sucker for the intense, perfumed red rose and sour red cherry flavors of great Nebbiolo wines. You’ll find plenty of both here. A match made in heaven with the braised guanciale (veal cheek), in which the high acids and strong tannins of the red to cut through the guanciale’s fatty texture. Lastly, don’t miss out on the wonderful desserts and the petit fours made here, the perfect way to finish a memorable meal.